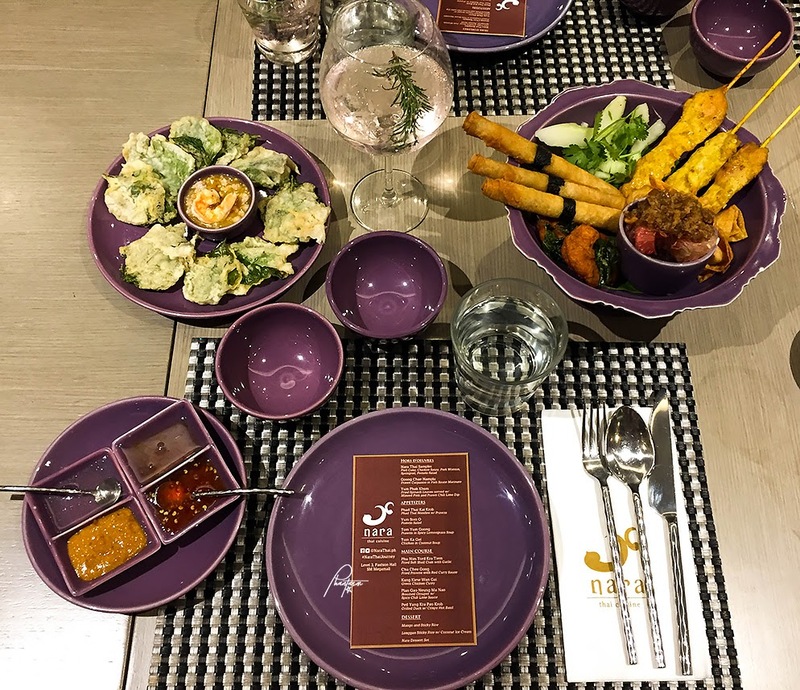 Nara Thai Cuisine has finally come to the Philippines! Together with family members from The KTG, we were invited to try out their menu. Sharing about our Nara Thai Cuisine. 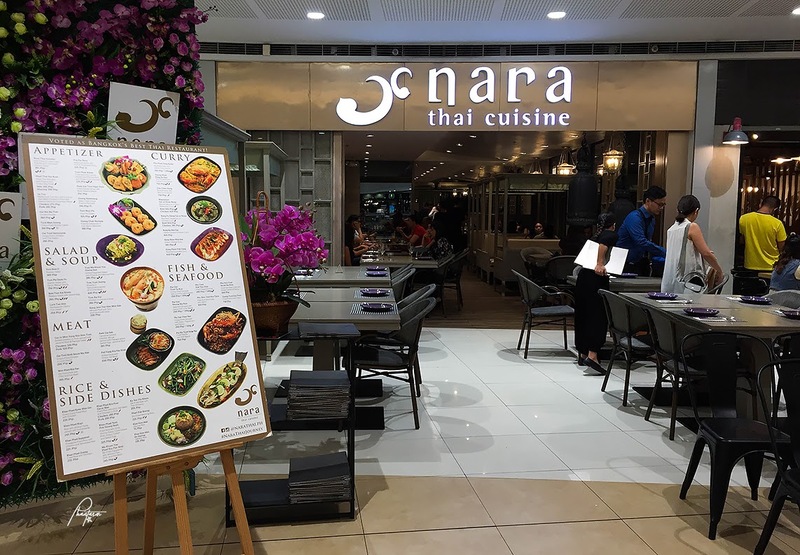 Voted as one of Bangkok's Best Thai Restaurants, Nara Thai Cuisine, currently has seven branches across Bangkok and around Asia with restaurants in Singapore, Hong Kong, Vietnam, Sri Lanka, Myanmar, Taiwan, Mumbai, and now in the Philippines. Brought by the Roku Group of Companies which has been an active player in the food and beverage industry (known for Roku Sushi + Ramen and Sushi Nori) and led by the mother-daughter partnership of Shiela and Milka Romero, they have again embarked on another flavorful journey as they officially open their first branch of Nara Thai Cuisine at the 3/F of Mega Fashion Hall of SM Megamall on February 2018. 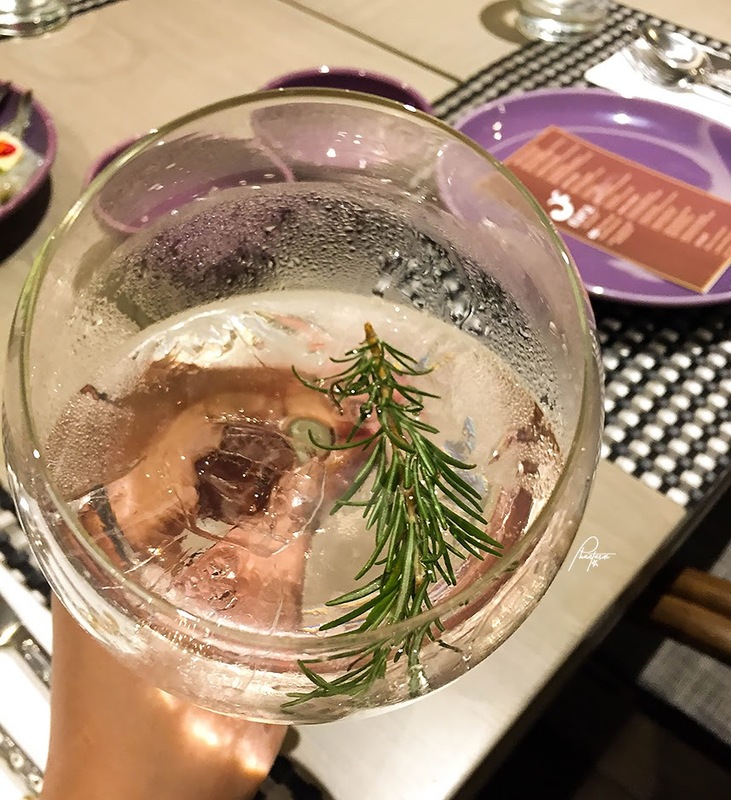 As we wait for the dishes to be served, we had the Gin and Tonic drink. Something good to set the mood with my KTG family with good conversation. 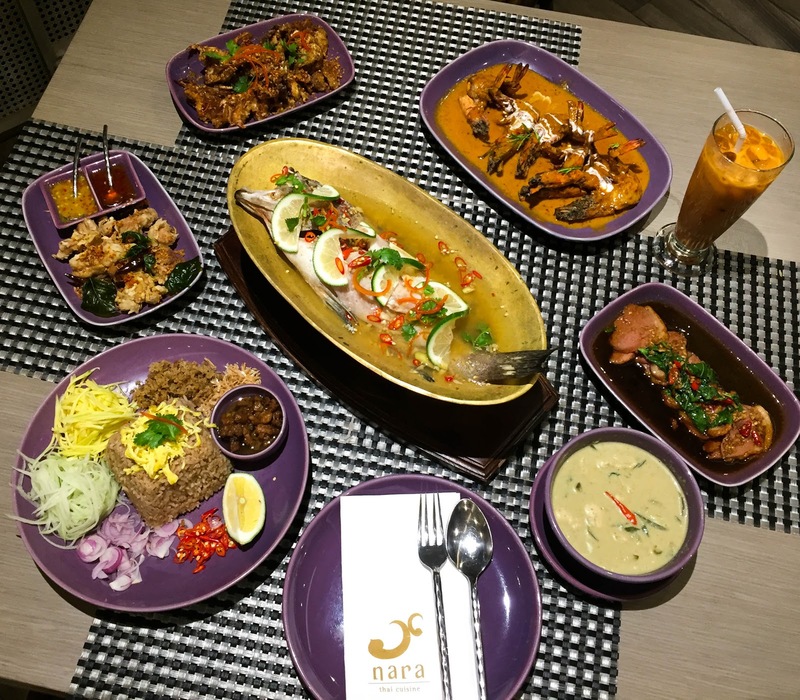 Nara Thai Cuisine offers authentic Thai dishes and recipes with a modern look that appeal to Thai cuisine enthusiasts. The menu is designed to capture all-day dining and dishes recommended for sharing. 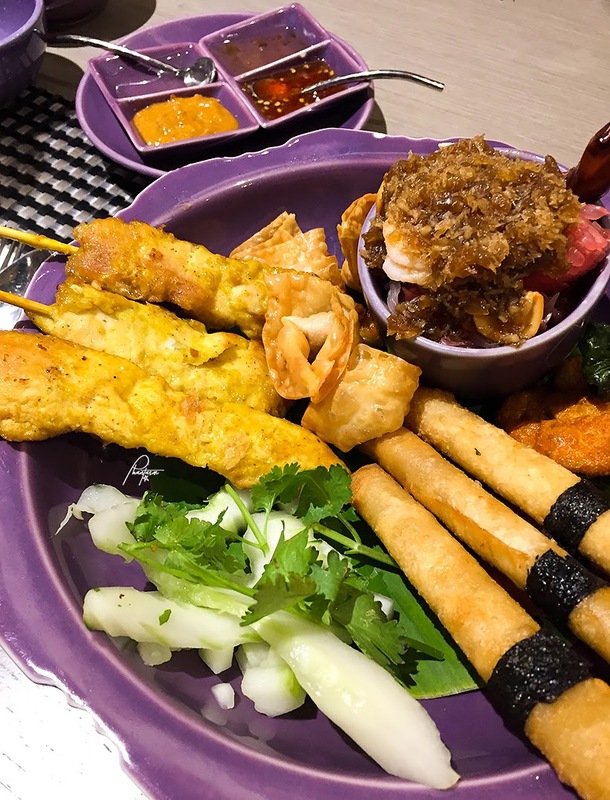 Nara Thai Sampler. Fish cake, chicken satay, pork wonton, spring roll, pomelo salad. Comes with four different sauces. I enjoyed the spring roll and the satay. Goong Chae Nampla. 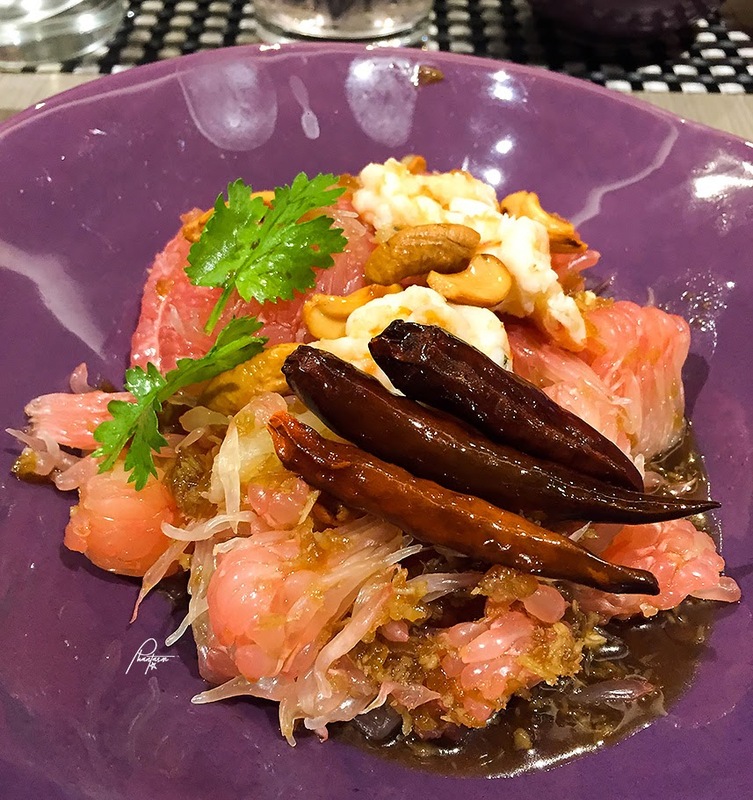 Prawn carpaccio in fish sauce marinate. I was hesitant to try this at first because it was raw shrimp. But hey, I've been having fish sashimi and I love it. 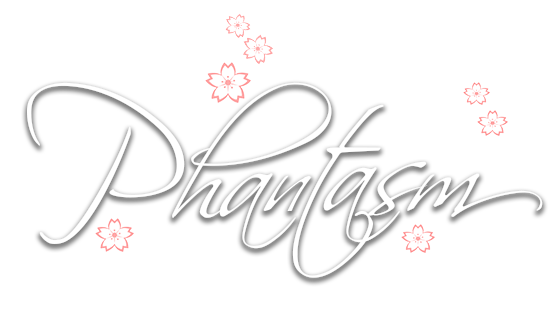 So I tried this one out, and apparently, I love it as well. I didn't try it with the chili, though. Yum Phak Khom. 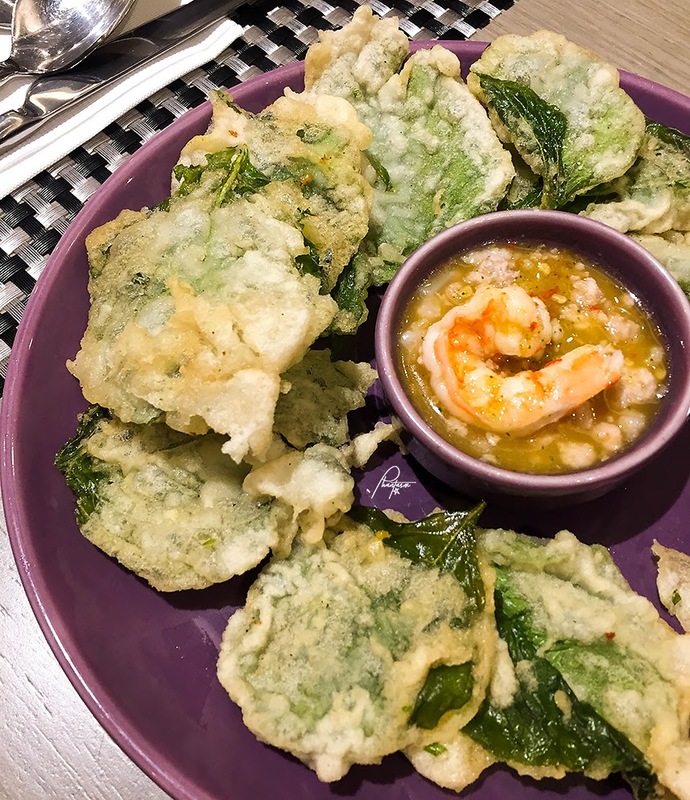 Fried spinach leaves served with minced pork and prawn chili lime dip. It resembles our crispy kangkong Filipino dish. Phad Thai Kai Krob. 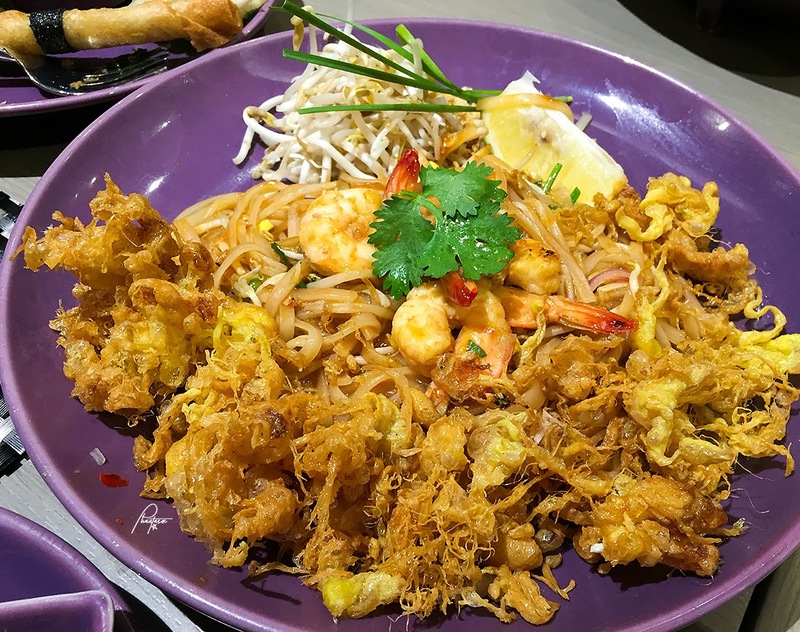 Phad Thai noodles with prawns. It's not the Pad Thai that I'm used to when I go to Thai restaurants but I like this one also. Gai Tord Samunprai. 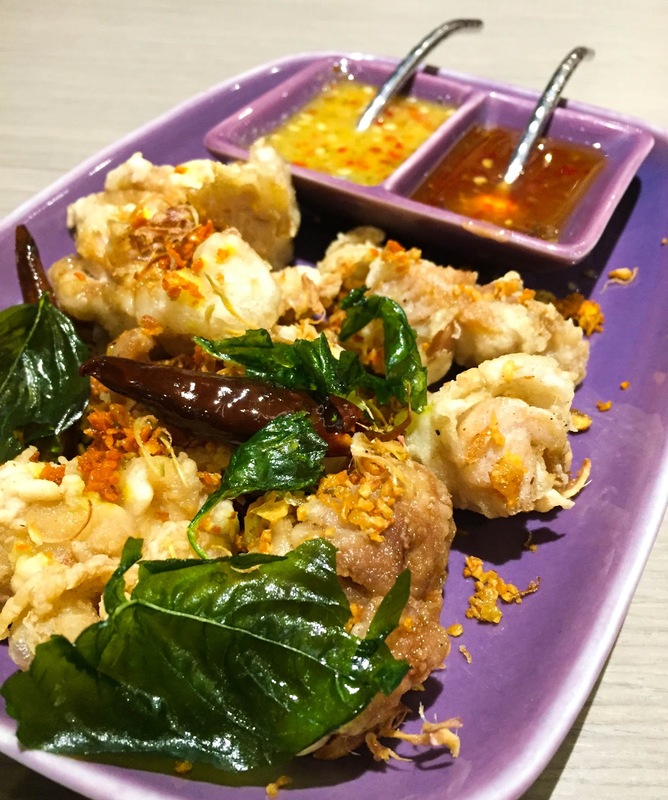 Crispy fried chicken and Thai herbs. Yum Som O. Pomelo Salad. I'm not a fan of pomelo (unless it's sweet pomelo juice) so I couldn't appreciate this much. 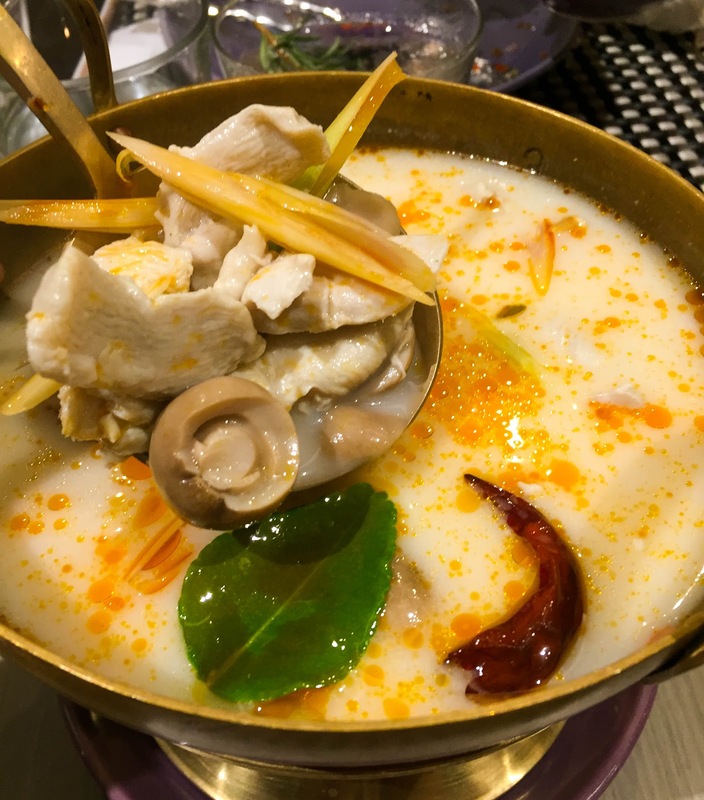 Tom Yum Goong. 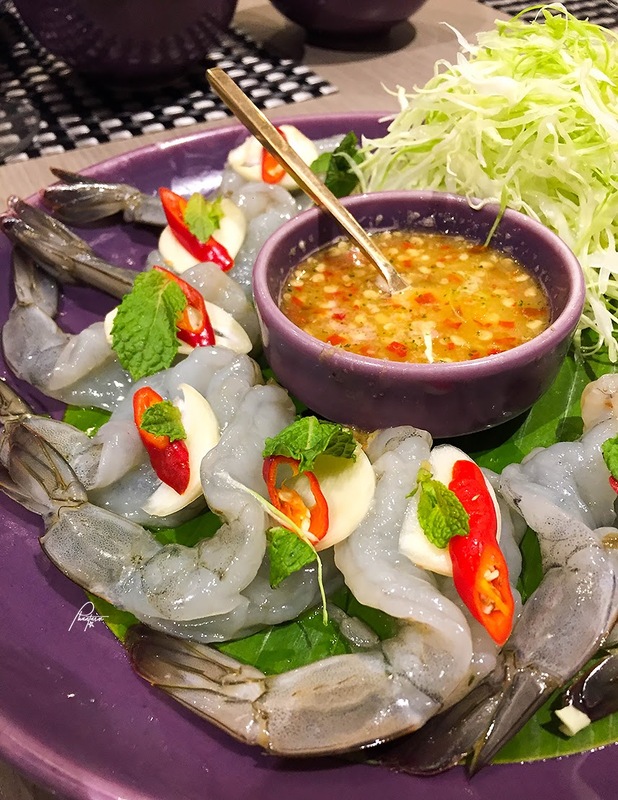 Prawns in spicy lemongrass soup. As red as it looks, it wasn't as spicy as I thought it would be. The spiciness is just right--not too spicy nor too subtle. It's good. Tom Ka Gai. Chicken in coconut soup. 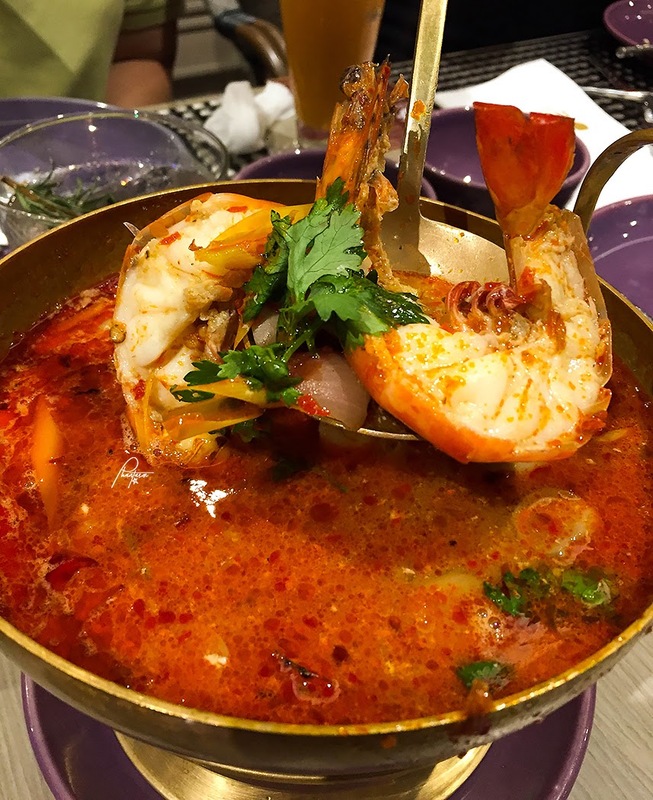 If you're afraid of Tom Yum because you're not fond of spicy dishes, then give this a try. Khao Phad Sapparod. Pineapple fried rice with chicken and shredded pork. There wasn't much chicken and shredded pork in this dish, though. The focus is really on the rice. 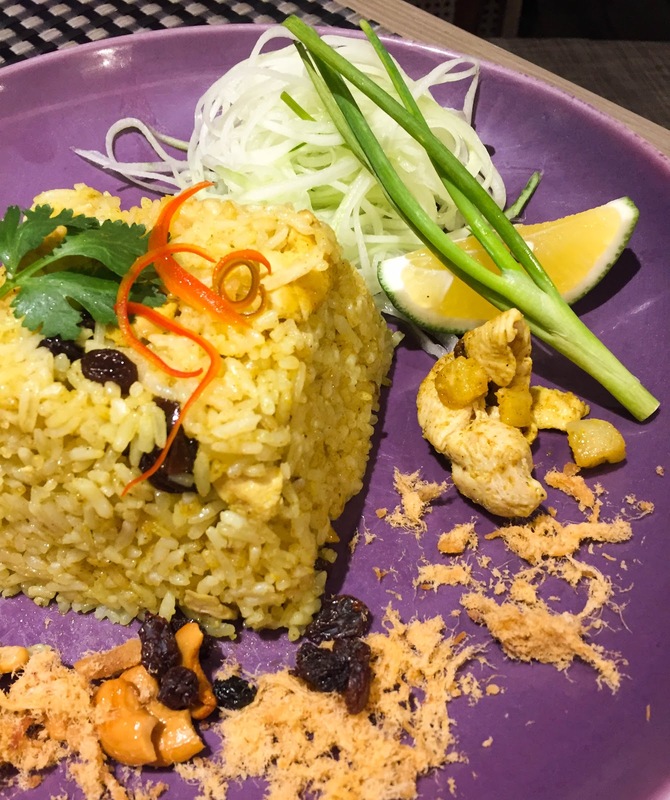 Khao Phad Kapi. 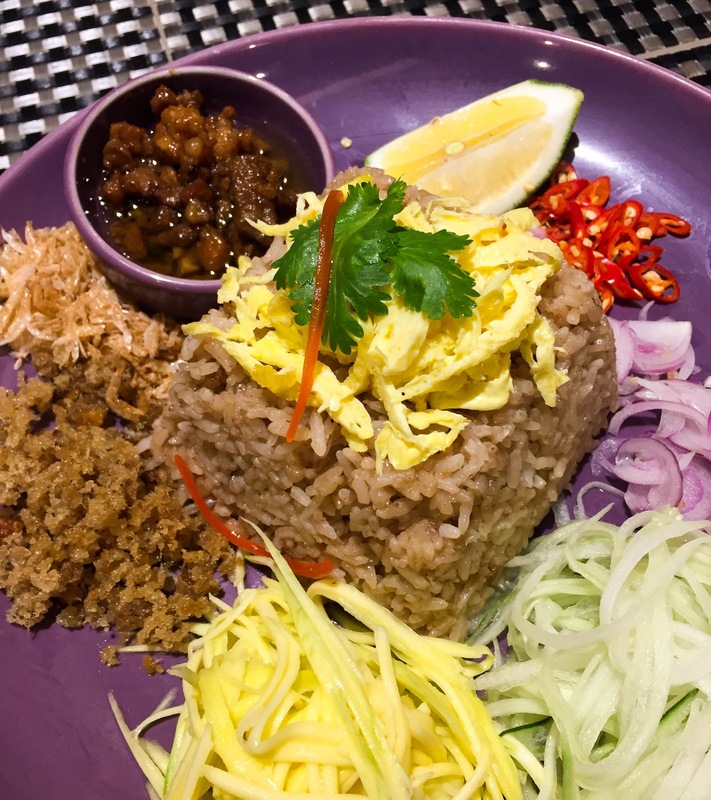 Rice with shrimp paste served with condiments. It's bagoong fried rice, Thai style. Kang Kiew Wan Gai. 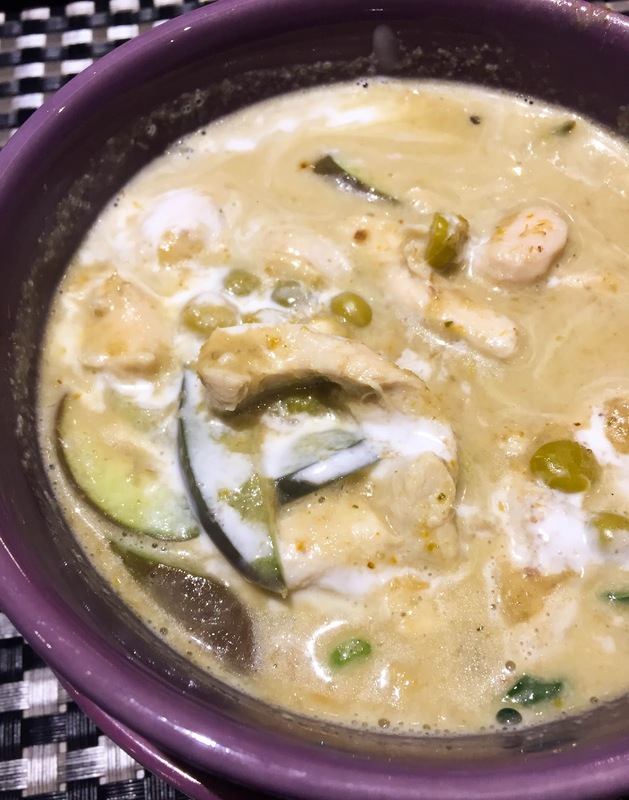 Green chicken curry. This didn't seem spicy but it is. Chu Chee Gong. 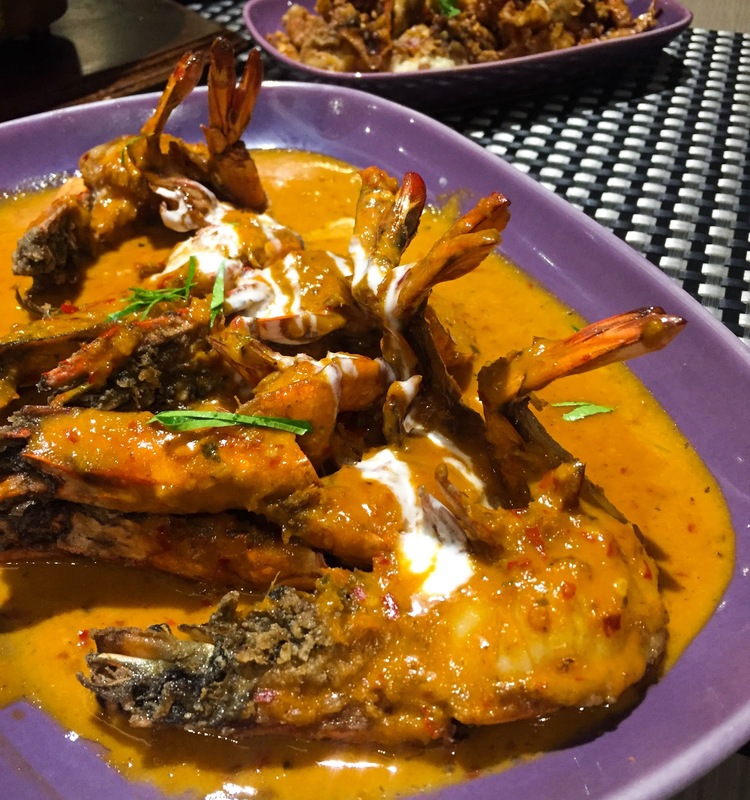 Fried prawns with red curry sauce. I like how their prawns are succulent. Phu Nim Tord Kra Tiem. 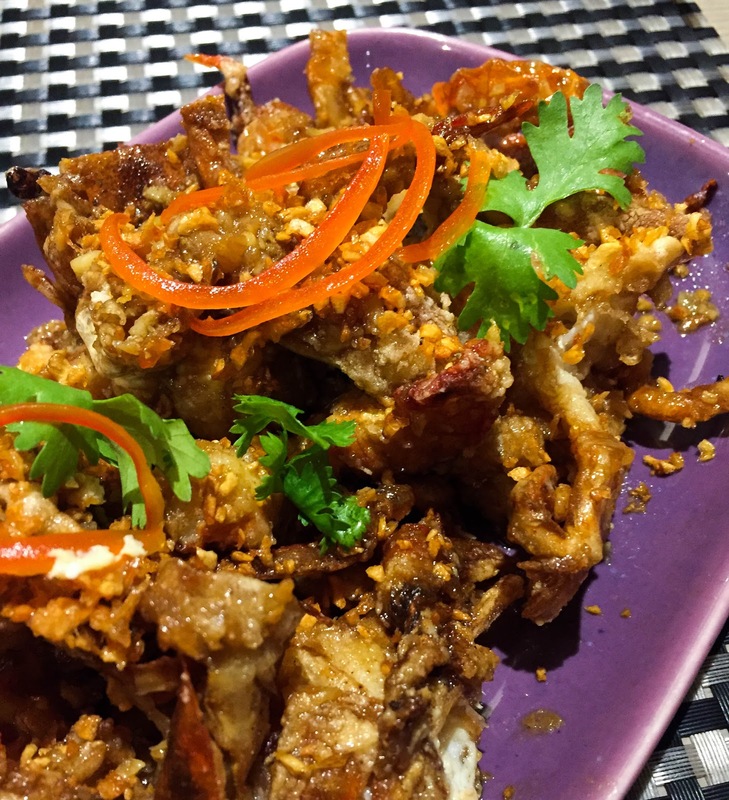 Fried soft shell crab with garlic. This is a favorite pick. It's so good. The crabs taste great and the generous amount of garlic makes it even better. Plan Gao Neung Ma Nao. 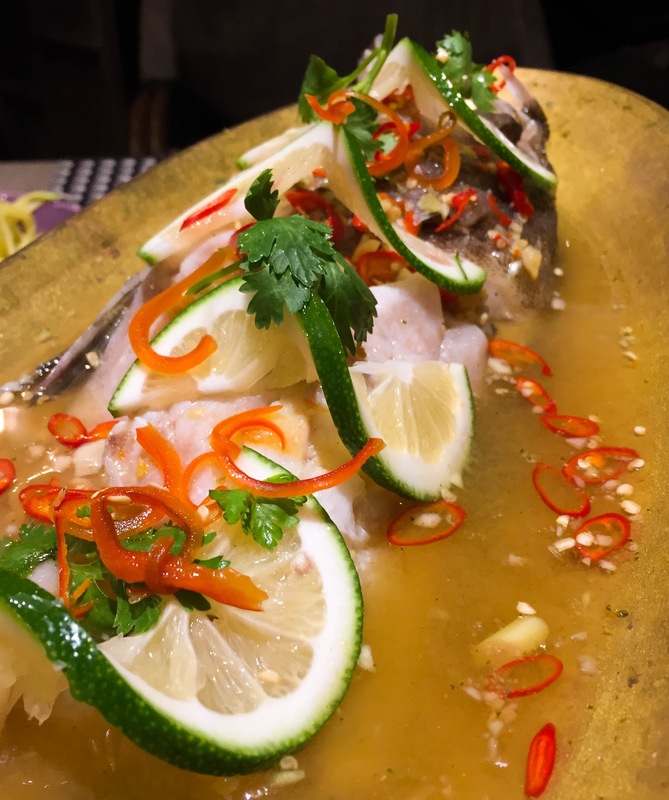 Steamed grouper with spicy chili lime sauce. Ped Yang Kra Pao Krob. 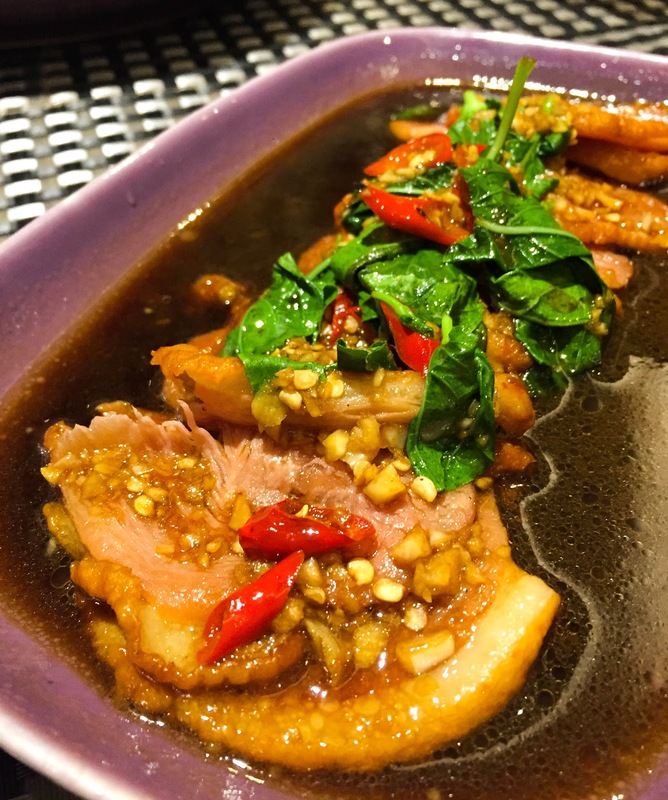 Grilled duck with crispy hot basil. 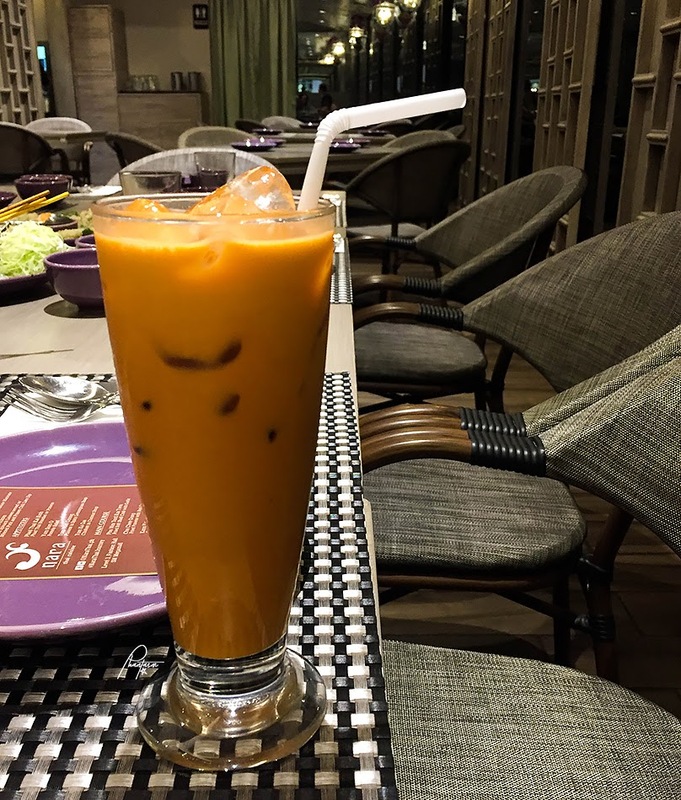 I also ordered Nara Thai Milk Tea in the middle of our meal. Something good to balance off the spiciness of some of the dishes that we had. It tastes good, too. Khao Niew Ma Muang. 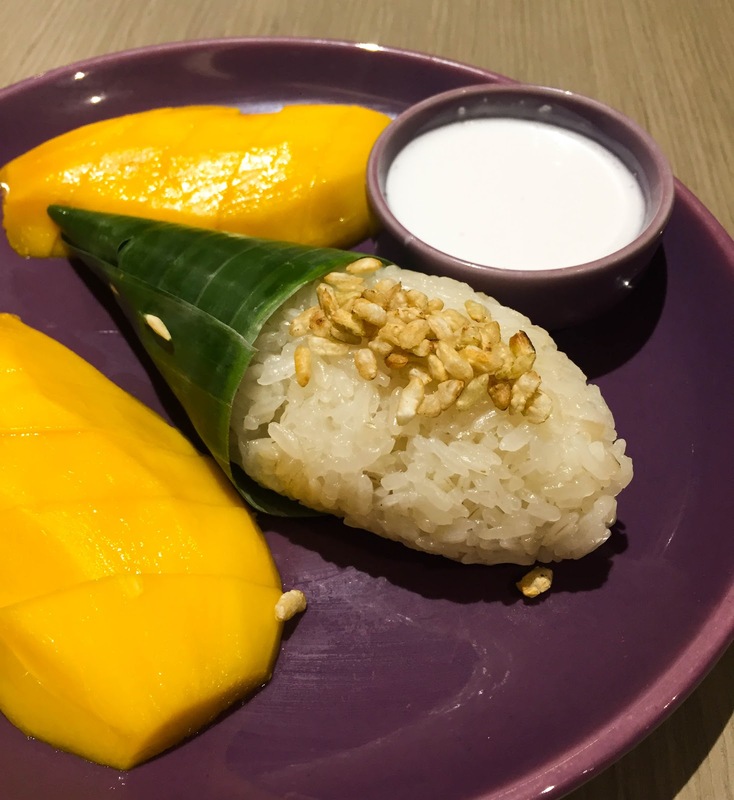 Mango and sticky rice with coconut milk. This is a common Thai dessert. The coconut milk tastes pure, not the sweet type--something to balance the slightly sour taste of the mango and sweetness of the sticky rice. Khao Niew Lam Yai Nai Maprow Ice Cream. 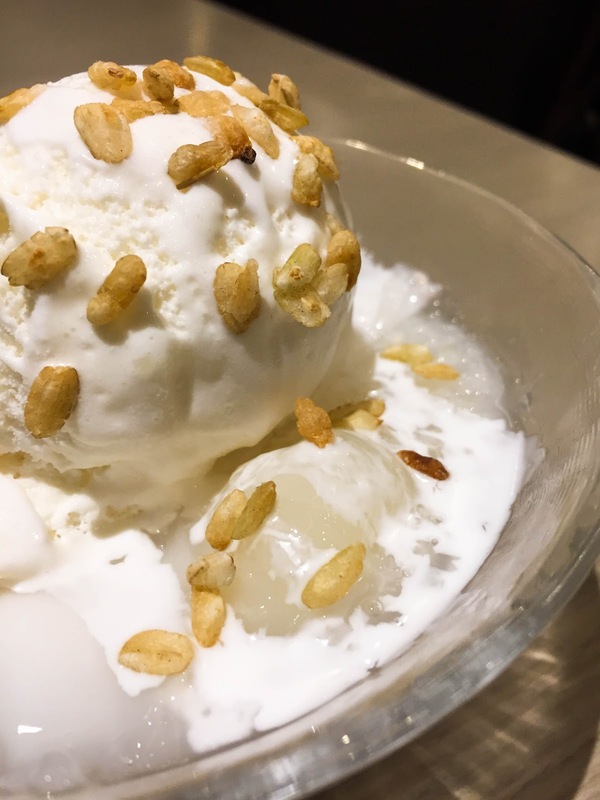 Longan sticky rice in coconut ice cream. Who knew sticky rice and ice cream would go so well? I love the coconut ice cream. Nara Dessert Set. Good for two. Two scoops of coconut ice cream with Thai sweet condiments. 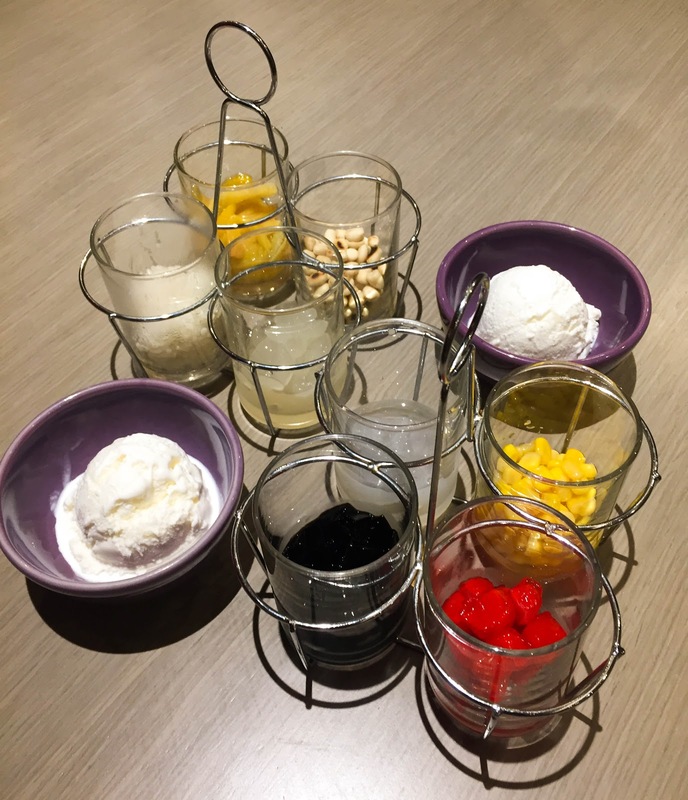 A single order comes with eight toppings for your ice cream.